I am sure you often dream of thick and lustrous hair. Enough of doing that because it’s time to wake up and make it real. Yeah, you read that right, and we have found out an ideal way for you to do so – hair thickening shampoos. Yes, they are fantastic and are your best bet for a great bounce. 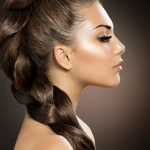 We all know that pollution and stress affect hair – they make your tresses thin, lifeless, and dull. All you need is a hair thickening shampoo to lift it up and add shine to it. It enhances your hair and personality. Just what you need, right? Hell, yeah! Well, then lucky you. We have a list of the best hair thickening shampoos available in India below. Just pick one. Go on. 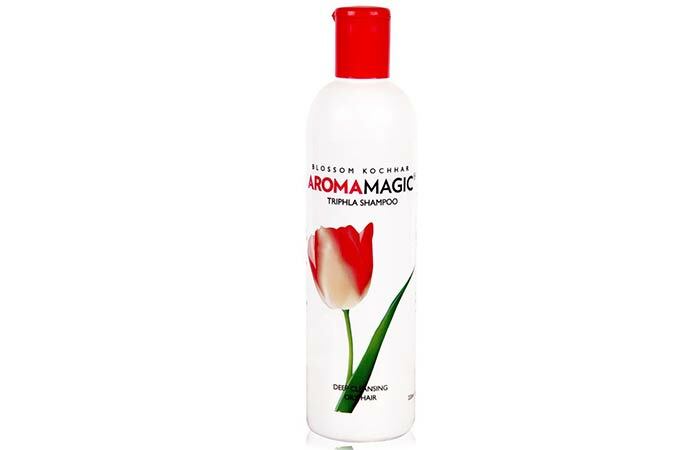 Aroma Magic Triphla Shampoo is easily the best thickening shampoo as it cleanses the hair thoroughly and adds volume and body to it. It also moisturizes and conditions the hair. The hair thickening shampoo contains Indian gooseberry, neem, and fenugreek extracts that add bounce and shine to the hair. 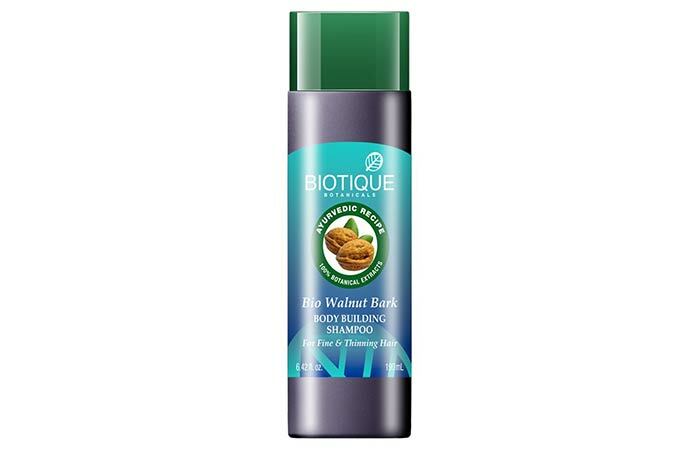 Biotique Bio Walnut Bark Body Building Shampoo revitalizes thin and dull hair. It makes the hair look fuller and thicker. The hair thickening shampoo contains pure walnut bark, soap nut, and amla that make the hair smooth and silky. BBLUNT Full On Volume Shampoo lifts fine hair and adds immense volume to it. It retains moisture and protects hair. The hair thickening shampoo contains rice protein, provitamin B5, and glycerin that nourish the hair and add bounce to it. Tvakh Hair Thickening Shampoo thickens the hair strands and provides essential nutrients to the hair. The hair thickening shampoo contains hibiscus extract, fatty acids, and vitamin A that add texture to thinning hair. 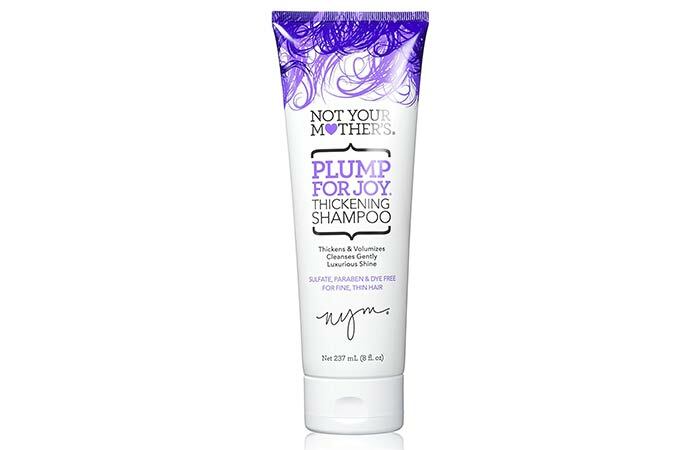 Not Your Mother’s Plump for Joy Thickening Shampoo provides fuller and thicker hair. It adds an oomph and zing to dull hair. The hair thickening shampoo contains a set of ingredients that facilitate the growth of hair. It prepares the hair for voluminous hairstyles. 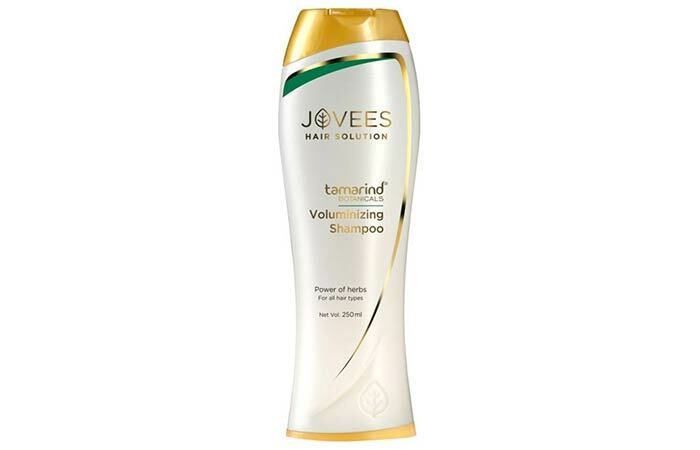 Jovees Herbal Tamarind Volumizing Shampoo adds volume to fine and limp hair. It also fights free radicals that damage hair. The hair thickening shampoo contains neem, tulsi, and reetha extracts that help in making the hair thick and healthy. Those with dry hair need to follow up with a conditioner. 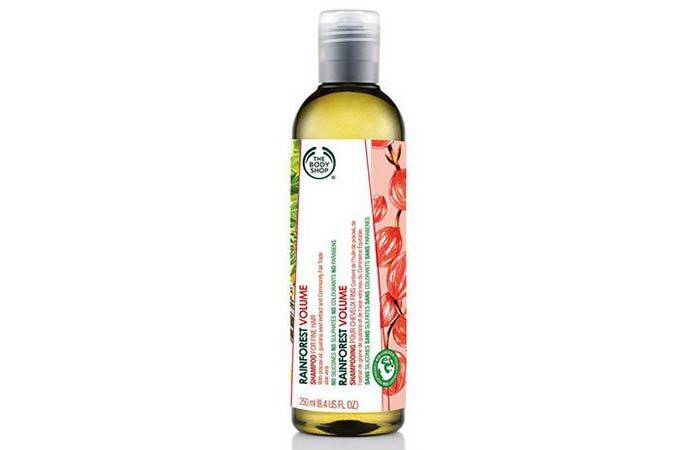 The Body Shop Rainforest Volume Shampoo boosts the volume of thin hair. It adds fullness and shine to the hair. The hair thickening shampoo contains pracaxi oil, guarana seed extract, and community fair trade aloe vera that keep the hair in good shape. Forest Essentials Bhringraj Hair Cleanser is the best shampoo for hair growth and thickening as it stimulates hair growth and controls hair thinning. It facilitates hair regrowth and also controls dandruff. The hair thickening shampoo contains shikakai extracts, licorice, and nutrients that add volume and strength to the hair. 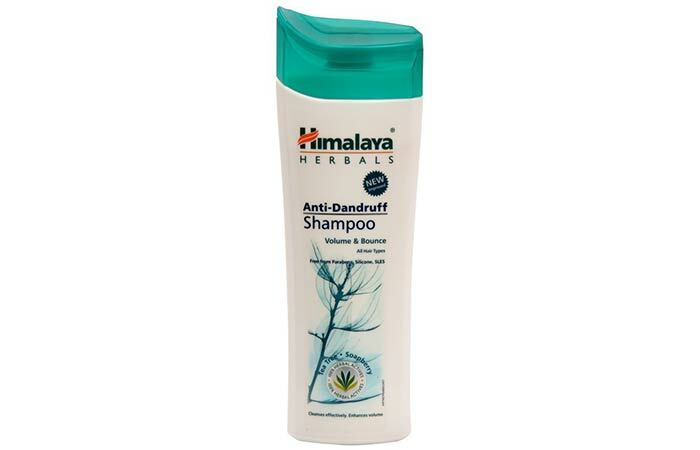 Himalaya Herbals Volume And Bounce Shampoo adds density to dull and lifeless hair. It is gentle on the scalp and reduces itching. The hair thickening shampoo contains soapberry extract, tea-tree oil, and basil extract that prevent dandruff and add volume to the hair. 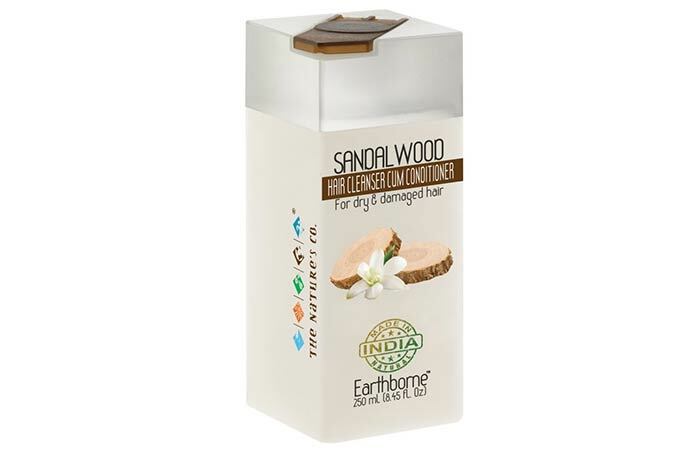 The Nature’s Co Sandalwood Hair Cleanser adds life and volume to damaged and treated hair. It nourishes and moisturizes the hair deeply. The hair thickening shampoo contains sandalwood extract, sunflower seed oil, and aloe vera plant extract that protect and enhance the hair. Rectangular shape of the bottle makes it inconvenient to hold. Nobody wants thin and damaged hair. It spoils the way you look and does not give enough leverage for you to play around with different hairstyles. You don’t want that to happen, right? 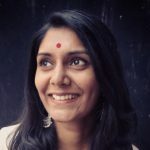 So, don’t give up on amazing hairstyles just because you have lanky hair – just pick a damage-controlling hair thickening shampoo and use it. How often should I wash my hair with a hair thickening shampoo? Wash your hair with a hair thickening shampoo twice or thrice a week depending on the need. Do hair thickening shampoos give permanent results? No, hair thickening shampoos do not give permanent results. They only add temporary volume to the hair. Can certain shampoos improve the health of your hair? Styling and taking care of fine hair can be tricky. Worry not, just pick out your favorite from our list of best hair products for fine hair and get going!